New Streaming Report Finds Netflix Still Dominating — but Are Others Catching Up? 2019 looks to be be even more eventful. As you may have noticed, there are a lot of streaming services. Netflix continues to dominate the binge-watching space, with Hulu and Amazon holding steady as more and more competitors — like Disney, Apple, and WarnerMedia, to name just a few — plan to enter an already crowded marketplace. Parrot Analytics has put together its latest Global Television Demand Report, which covers 10 global markets and looks at trends in market share and genre, and found that Netflix accounts for a full 68% of expressed demand. 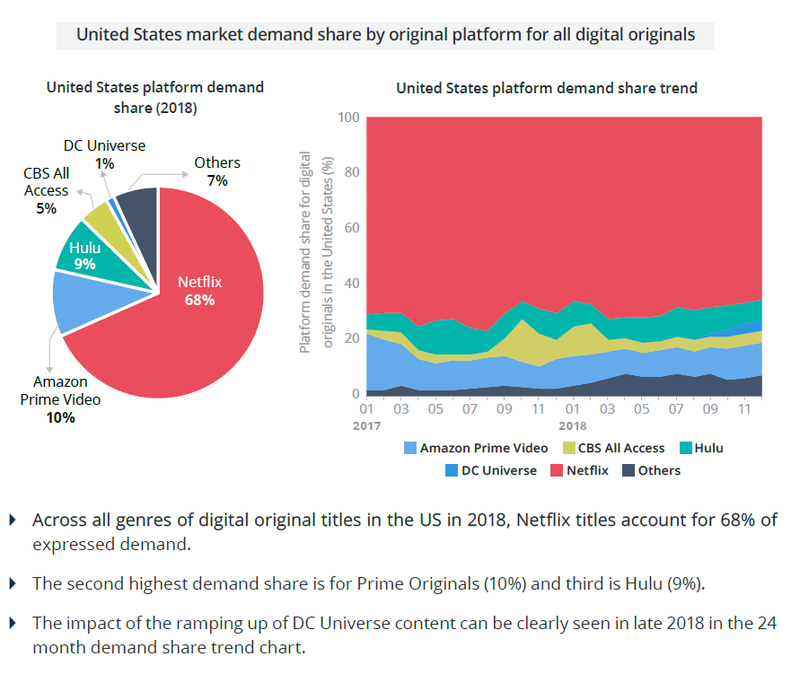 Parrot’s report defines that metric as “the total audience demand being expressed for a title, within a country, on any platform.” Netflix is followed by Amazon Prime Video at 10% and Hulu at 9%, with CBS All Access (5%), the DC Universe (1%), and all others (7%) completing the circle. The study also examined travelability, or “where in the world local productions find an audience overseas, relative to the content’s country of origin,” finding that American content does best in other English-speaking countries but still travels better than shows produced in most other markets. All streaming platforms combined debuted more than 300 new original series last year, 130 of which came from Netflix alone. More surprising is the demand for “Chilling Adventures of Sabrina” and “La Casa De Papel,” both of which were number one in three out of 10 markets; “Stranger Things” and “Star Trek Discovery” were number one in two markets apiece.